We are performing "Come What May" from Moulin Rouge, arranged by Natasha Vinetskaya for Trio Maxim. on Sunday, July 17th, 20116 at St. Marks Lutheran church in Fairfield. We just played for a wedding at Cornerstone Sonoma located at the gates of the Wine Country. Grape fields, gardens, boutiques, restaurants, live music. Who could ask for anything more? The weather was very comfortable. What a beautiful spot to have a wedding! Our best wishes to Desiree and Nick! Recently, I started to experiment with "light painting" photography. I found about this process by watching a tutorial by great photographer Oleg Zotov. It is a very simple process really. In a dark room, the camera is set to a very long exposure from 10 to 30 seconds and then the light source is introduced. It could be done with simple pocket flashlight. It is really fun and easy to do! Experiment with different exposure time to get the best results. 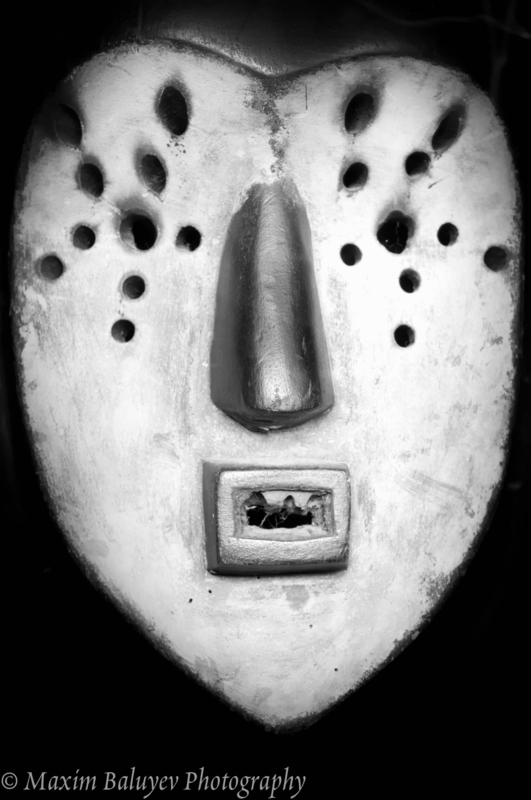 Here are three photos of African mask made by Bakuba Tribe from Zaire. No Photoshop tricks were used to create these photos. The flashlight was fitted with red & blue color filters. Middle photo is plain black and white shot. ISO 200, F-stop 16, Manual focus. Lasso & Coins wedding ceremony, also known as Arras & Lazo ceremony is very popular among Filipino, Mexican and Spanish communities. The Lasso, (or Lazo) most commonly made of rosary beads, painted wood or crystal, symbolizes infinite bond of love of the couple. The Lasso is roped around the couple to signify a tight bond they share. Later in the ceremony bride and groom exchange special coins (or Arras) which signify wealth and prosperity and are exchanged as a pledge of dedication to each other. Trio Maxim has been lucky to take part in this great wedding ritual, and we send our regards to the newlyweds Gabriel & Gabriella! This violin was made by famous Ernst Heinrich Roth in the town of Markneukirchen Germany. The manufacturing date is 1930. Enjoy! Good job guys! Here is the whole gang! Pictured from the left: Leon, Katelin, Madison, Jiselle, Kimberly and Rianna. Mezzo-Forte carbon fiber violin VS classic wooden violin matchup! As promised, I am posting two videos for you to compare. A classic 120 year old wooden violin vs brand new carbon fiber violin! Which one is better? For audio recording I have used two MXL 770 small-diaphragm condenser microphones. Audio processing was done with Audacity software. Video was recorded with Go Pro Hero Sessions. Your comments and likes are always appreciated. What a wonderful Celebration it was... Look at these macaroon towers! Our congratulations and best wishes to a lovely couple Sushrut and Shu! Found this interesting violin related post on Gizmodo. Please click HERE to read it. 3DVARIUS photos were posted with expressed permission from the 3D-varuis.com. Here you can see technical drawing of the design. We just finished working on a new business card design for Trio Maxim. Enjoy!